Welcome to our store and you may search "Barbarians tactical" for more tacticals. Tactical MOLLE eyeglass case is more durable than other simple eyeglass case, is able to protect your glasses better. Double zippers help you open the case from two ways. Soft lining can protect your glasses better. 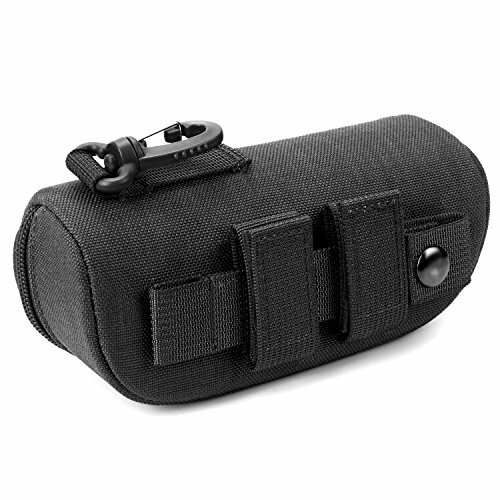 MOLLE strap and D-ring help you carry the case conveniently. Made from high-density 1000D Nylon and thick PE board, our eyeglass case can protect your glasses from water and press. D-ring and MOLLE strap are included. You could hang the case on belt or other MOLLE panel easily. Soft lining prevents your classes from bump. A pocket inside will help you store case or cards. Dimension: 6.5 x 3 x 2.5 Inch. The pouch can hold most types of glasses. If you have any questions about this product by Barbarians, contact us by completing and submitting the form below. If you are looking for a specif part number, please include it with your message.